1.- We express our total repudiation of the rise of hate crimes (5 at this moment) that have been executed in the last 96 hours in the department of La Paz, El Salvador, against Trans women: Yasuri Yadhira Jandres (Rony Alexander Orellana ), Transgender woman of San Luis Talpa, assassinated the 19 of February of 2017; Daniela Rodríguez (Daniel Antonio Rodríguez), transgender woman of San Luis Talpa, murdered on February 19, 2017, Elizabeth Castillo (Wilber Adalberto Artiga Castillo), transgender woman of San Luis Talpa murdered on February 21, 2017 among others who have been deprived of their life. As a consequence of these acts, many more have had to flee to safeguard their lives. 2.- We express our nonconformity against the lack of application of the reform of the Criminal Code of the Republic of El Salvador, which in its article 129, reformulated in its sections 1 and 2, subsection 11 clearly mandates "That in the country repugnant crimes of intolerance and hatred have occurred, especially directed against victims by reason of their gender, gender identity and gender expression or sexual orientation. 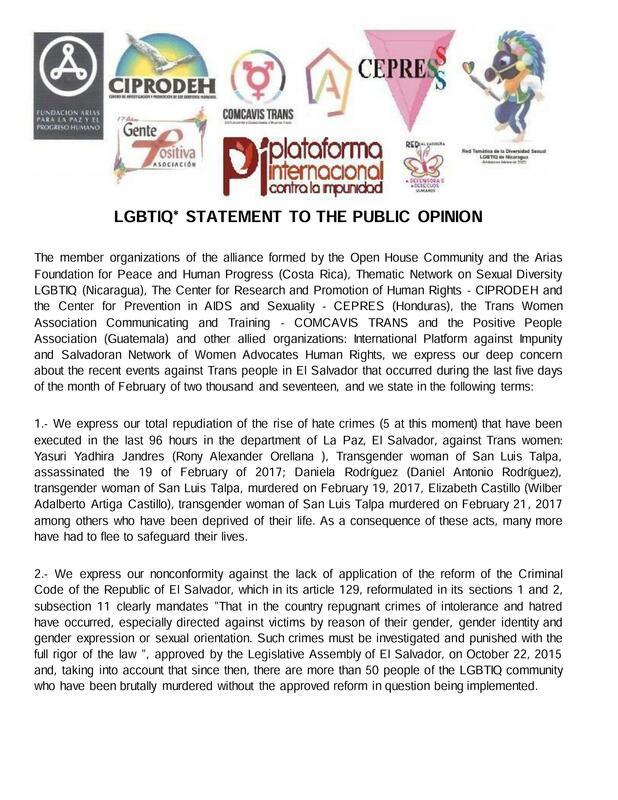 Such crimes must be investigated and punished with the full rigor of the law ", approved by the Legislative Assembly of El Salvador, on October 22, 2015 and, taking into account that since then, there are more than 50 people of the LGBTIQ community who have been brutally murdered without the approved reform in question being implemented. 3. 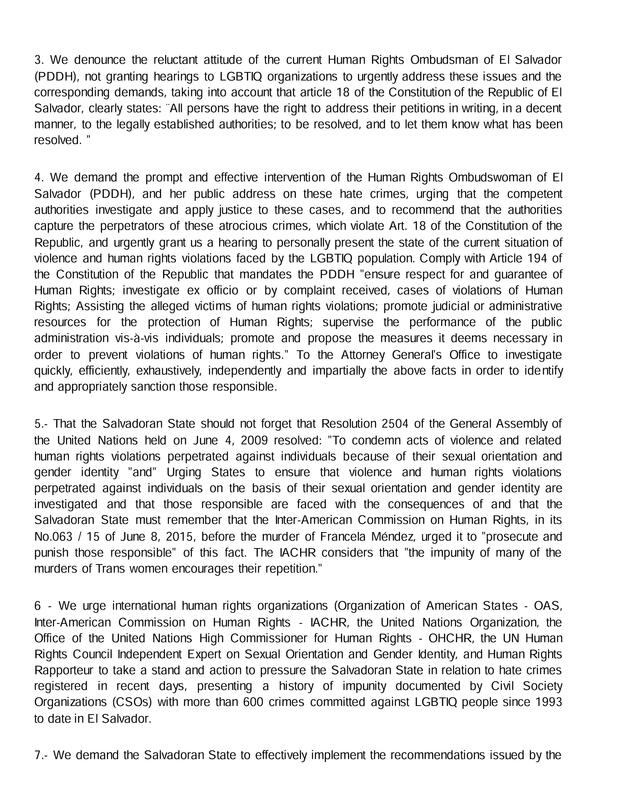 We denounce the reluctant attitude of the current Human Rights Ombudsman of El Salvador (PDDH), not granting hearings to LGBTIQ organizations to urgently address these issues and the corresponding demands, taking into account that article 18 of the Constitution of the Republic of El Salvador, clearly states: ¨All persons have the right to address their petitions in writing, in a decent manner, to the legally established authorities; to be resolved, and to let them know what has been resolved. " 4. We demand the prompt and effective intervention of the Human Rights Ombudswoman of El Salvador (PDDH), and her public address on these hate crimes, urging that the competent authorities investigate and apply justice to these cases, and to recommend that the authorities capture the perpetrators of these atrocious crimes, which violate Art. 18 of the Constitution of the Republic, and urgently grant us a hearing to personally present the state of the current situation of violence and human rights violations faced by the LGBTIQ population. Comply with Article 194 of the Constitution of the Republic that mandates the PDDH "ensure respect for and guarantee of Human Rights; investigate ex officio or by complaint received, cases of violations of Human Rights; Assisting the alleged victims of human rights violations; promote judicial or administrative resources for the protection of Human Rights; supervise the performance of the public administration vis-à-vis individuals; promote and propose the measures it deems necessary in order to prevent violations of human rights." To the Attorney General's Office to investigate quickly, efficiently, exhaustively, independently and impartially the above facts in order to identify and appropriately sanction those responsible. 5.- That the Salvadoran State should not forget that Resolution 2504 of the General Assembly of the United Nations held on June 4, 2009 resolved: "To condemn acts of violence and related human rights violations perpetrated against individuals because of their sexual orientation and gender identity "and" Urging States to ensure that violence and human rights violations perpetrated against individuals on the basis of their sexual orientation and gender identity are investigated and that those responsible are faced with the consequences of and that the Salvadoran State must remember that the Inter-American Commission on Human Rights, in its No.063 / 15 of June 8, 2015, before the murder of Francela Méndez, urged it to "prosecute and punish those responsible" of this fact. The IACHR considers that "the impunity of many of the murders of Trans women encourages their repetition." 6 - We urge international human rights organizations (Organization of American States - OAS, Inter-American Commission on Human Rights - IACHR, the United Nations Organization, the Office of the United Nations High Commissioner for Human Rights - OHCHR, the UN Human Rights Council Independent Expert on Sexual Orientation and Gender Identity, and Human Rights Rapporteur to take a stand and action to pressure the Salvadoran State in relation to hate crimes registered in recent days, presenting a history of impunity documented by Civil Society Organizations (CSOs) with more than 600 crimes committed against LGBTIQ people since 1993 to date in El Salvador. IACHR in 2013 regarding LGBTIQ persons and the Universal Periodic Review in 2015, because it is responsibility of the Salvadoran State to guarantee the safety of all its citizens. 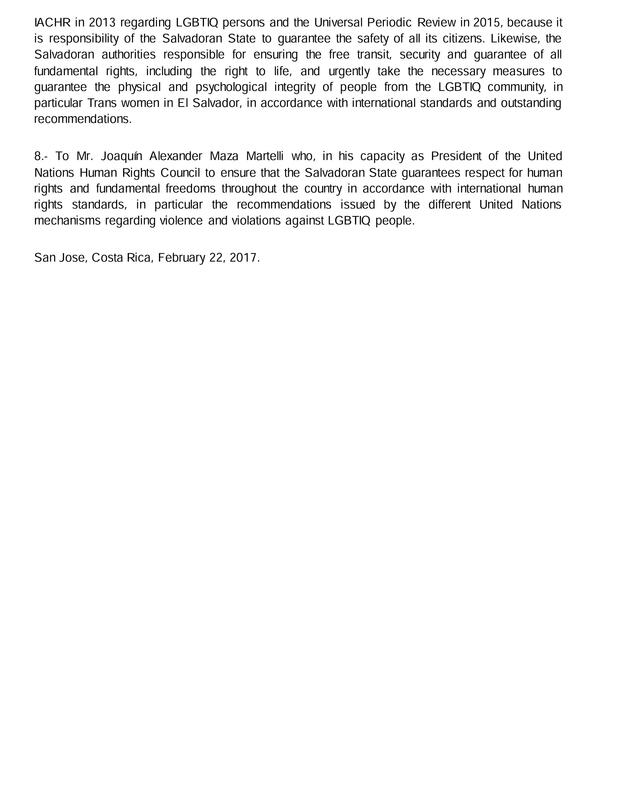 Likewise, the Salvadoran authorities responsible for ensuring the free transit, security and guarantee of all fundamental rights, including the right to life, and urgently take the necessary measures to guarantee the physical and psychological integrity of people from the LGBTIQ community, in particular Trans women in El Salvador, in accordance with international standards and outstanding recommendations. 8.- To Mr. Joaquín Alexander Maza Martelli who, in his capacity as President of the United Nations Human Rights Council to ensure that the Salvadoran State guarantees respect for human rights and fundamental freedoms throughout the country in accordance with international human rights standards, in particular the recommendations issued by the different United Nations mechanisms regarding violence and violations against LGBTIQ people. San Jose, Costa Rica, February 22, 2017.